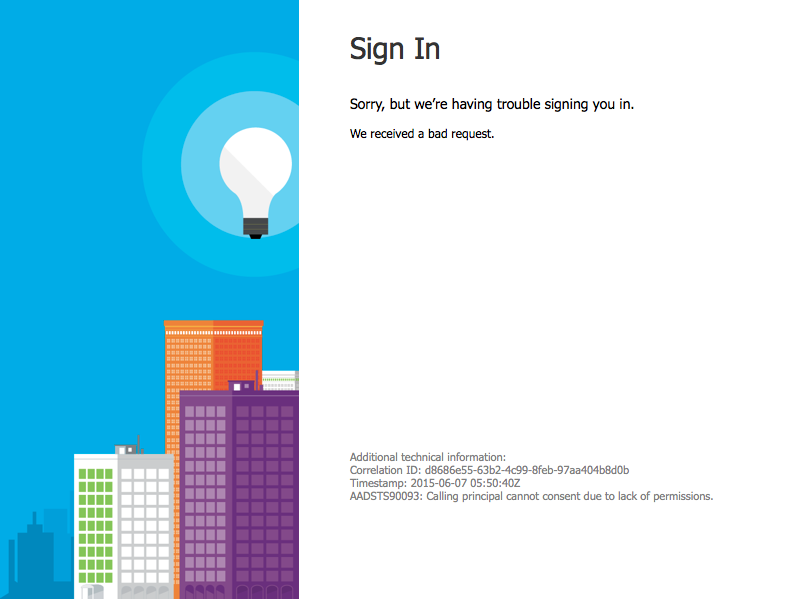 When you develop your own applications which use the Office 365 REST API, it might happen that users are facing the following error message when they try to authenticate, when your application is supposed to ask the consent of the user to access his data. The difficult thing to understand is why this message is displayed and why all users are not concerned ? When you create an application, you have to declare which rights are needed to access data when you make calls to the REST API. Those rights are declared in Azure AD through the web console (https://manage.windowsazure.com) as you can see below. Which is not indicated in the web console is that some of those rights need that an administrator (at the tenant level) give a consent to allow your application to use them. If the consent of an administrator was not given and a non-administrator user tries to use the application, he will receive the following error message : AADSTS90093 – Calling principal cannot consent due to lack of permissions. What permissions require an administrator consent ? In short if you want to know what permissions require an administrator consent, it depends of which product and which features you want to use. You can find below a quick summary (grouped by products) of all the permissions which require an administrator consent. All other permissions (not listed below) only require a user consent. What to do if I encounter the error message ? If you are facing to the error message mentioned previously, the first thing to do is to check if your application uses one of the permission in the list above. If it’s the case, make sure that you absolutely need it, otherwise remove the right from the declared permissions for your application in Azure AD and it should solve the problem. 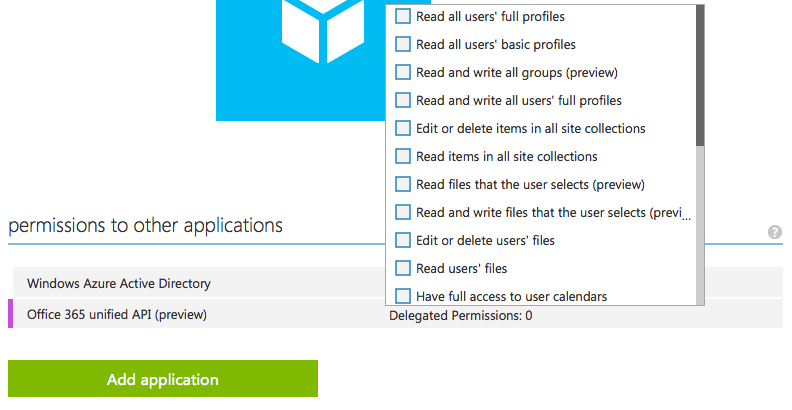 For example, you can perform searches on SharePoint sites under the identity of the current user, even if you only have the “Read items in all site collection” permission. It’s not needed to add the “Run search queries as a user” permission. If you need the permission, you have to ask a tenant administrator to consent your application. Until the administrator consent, all users which are not administrators of the Office 365 tenant won’t be able to log-in and use your application. 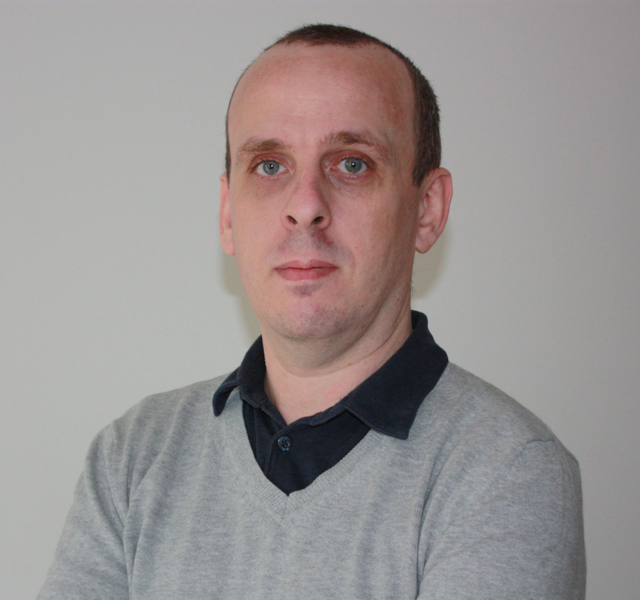 This entry was posted in Azure AD, Office 365 - REST API and tagged Azure AD, Exchange, Office 365, REST, SharePoint, Yammer on June 8, 2015 by Stéphane Cordonnier (@s_cordonnier). Build conference was held in San Francisco this week (from April 29th to May 1st) and it was the place to be because Microsoft made a lot of announcements around its ecosystem (Windows 10, Azure, HoloLens, Office 365…). Among all the news annouced this week, we particularly appreciated the launch (in preview version for now) of the Office 365 unified API. Let’s take a look to this new API. Why a new API ? Each of these features are offered by a dedicated product (Azure AD, Exchange, Lync, SharePoint, Yammer, OneDrive for Business…) and it was pretty complicated to develop solutions which are connected with all of them. 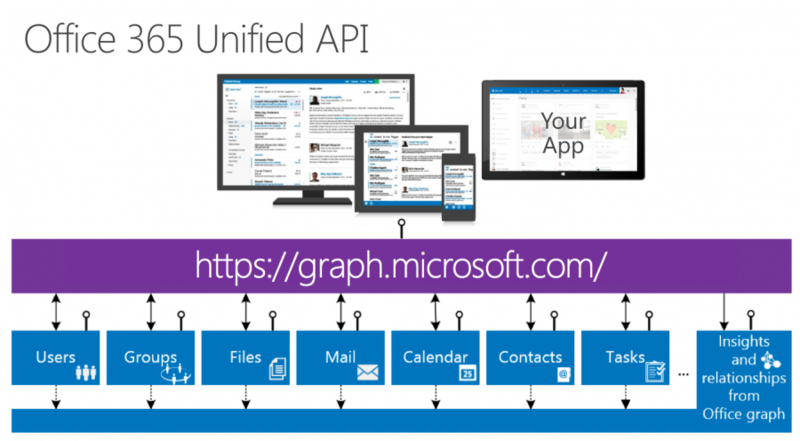 It’s to simplify all of this, that the new Office 365 Unified API was created. It allows developers to create solutions which are able to reach the content of each product from a single endpoint. A single endpoint is more easy to use and it simplifies a lot of tasks such as managing authentication tokens (you need one access token for each endpoint when you use the actual Office 365 APIs). To retrieve data from your tenant and after successful completion of the authentication process, you can send requests to the endpoint as you can see in the following examples. In the examples presented in this article, we only saw how to get data but you are already able to perform CRUD operations as you can do it today with other dedicated endpoints. It’s also good to note that Microsoft has updated its client libraries for .NET, iOS and Android to support the new unified API. The Office 365 Unified API available today is just the first version (a preview version) and a lot of improvements will be available in the future. New data types will be added in the next few months. Want to learn more and want to try it ? If you want to learn more about the new Office 365 Unified API, you can also refer to the official documentation available at http://dev.office.com/unifiedAPIs. This entry was posted in Microsoft Graph, Office 365 - REST API and tagged Azure AD, Exchange, Lync, Office 365, Office Graph, REST, SharePoint on May 4, 2015 by Stéphane Cordonnier (@s_cordonnier).